Astronomers have used data from three of NASA's Great Observatories to make the most detailed study yet of an extremely massive young galaxy cluster. This rare galaxy cluster, which is located 10 billion light-years from Earth, is almost as massive as 500 trillion suns. This object has important implications for understanding how these megastructures formed and evolved early in the universe. 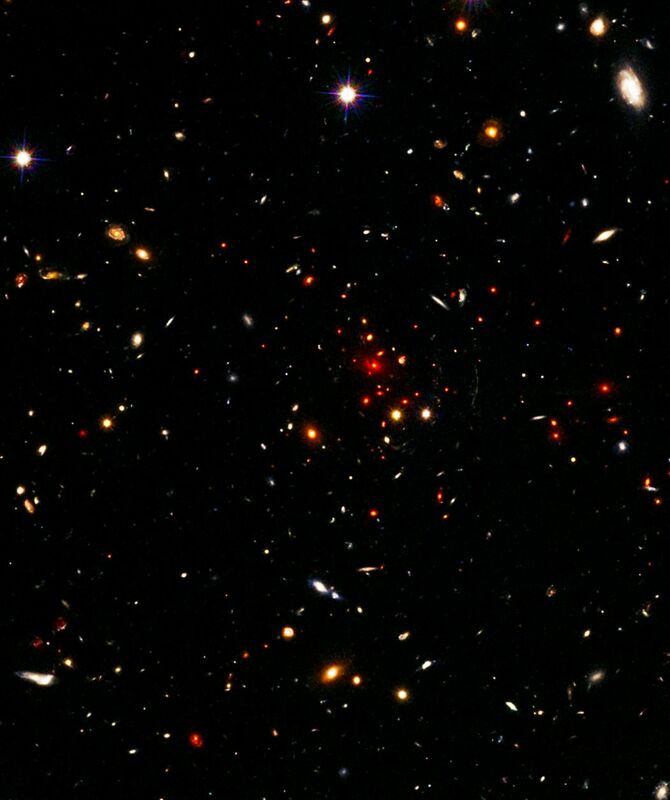 The galaxy cluster, called IDCS J1426.5+3508 (IDCS 1426 for short), is so far away that the light detected is from when the universe was roughly a quarter of its current age. It is the most massive galaxy cluster detected at such an early age. First discovered by the Spitzer Space Telescope in 2012, IDCS 1426 was then observed using the Hubble Space Telescope and the Keck Observatory to determine its distance. Observations from the Combined Array for Millimeter-wave Astronomy indicated it was extremely massive. New data from the Chandra X-ray Observatory confirm the galaxy cluster mass and show that about 90 percent of the mass of the cluster is in the form of dark matter, a mysterious substance detected so far only through its gravitational pull on normal matter composed of atoms. "We are really pushing the boundaries with this discovery," said Mark Brodwin of the University of Missouri at Kansas City, who led the study. "As one of the earliest massive structures to form in the universe, this cluster sets a high bar for theories that attempt to explain how clusters and galaxies evolve." Galaxy clusters are the largest objects in the universe bound together by gravity. Because of their sheer size, scientists think it should take several billion years for them to form. The distance of IDCS J1426 means astronomers are observing it when the universe was only 3.8 billion years old, implying that the cluster is seen at a very young age. The data from Chandra reveal a bright knot of X-rays near the middle of the cluster, but not exactly at its center. This overdense core has been dislodged from the cluster center, possibly by a merger with another developing cluster 500 million years prior. Such a merger would cause the X-ray-emitting, hot gas to slosh around like wine in a glass that is tipped from side to side. "Mergers with other groups and clusters of galaxies should have been more common so early in the history of the universe," said co-author Michael McDonald of the Massachusetts Institute of Technology in Cambridge, Massachusetts. "That appears to have played an important part in this young cluster's rapid formation." Aside from this cool core, the hot gas in the rest of the cluster is very smooth and symmetric. This is another indication that IDCS 1426 formed very rapidly. In addition, astronomers found possible evidence that the abundance of elements heavier than hydrogen and helium in the hot gas is unusually low. This suggests that this galaxy cluster might still be in the process of enriching its hot gas with these elements as supernovae create heavier elements and blast them out of individual galaxies. "The presence of this massive galaxy cluster in the early universe doesn't upset our current understanding of cosmology," said co-author of Anthony Gonzalez of the University of Florida in Gainesville, Florida. "It does, however, give us more information to work with as we refine our models." Evidence for other massive galaxy clusters at early times has been found, but none of these matches IDCS 1426, with its combination of mass and youth. The mass determination used three independent methods: a measurement of the mass needed to confine the hot X-ray-emitting gas to the cluster, the imprint of the cluster's gaseous mass on the cosmic microwave background radiation, and the observed distortions in the shapes of galaxies behind the cluster, which are caused by the bending of light from the galaxies by the gravity of the cluster.